I have been caring for foster pets for just over a year for two different animal rescues. It has been a wonderful experience. I have wanted to share this with you here on Squidoo for a while, but I always feel I am a bit too busy to actually sit down and write about all of these animals. Today I decided I better start this now or I might never get around to it. You see, tomorrow I am going to get eight more cats! Yes, you read that correctly. Eight cats! This is addition to the four cats, two dogs, five hens and one parakeet I am already taking care of! You can see why if I get behind on this project I may never get caught up! Let me introduce you to my foster pets so far! Photos property of the author. All rights reserved. I have not read this book, but it is on my list to read. It was recommended to me by a member of the No Kill Louisville directors. This book recounts the history of one of the largest no-kill animal sanctuaries in the country. Along the way it tells the story of some of the thousands of abandoned, neglected and abused animals who have found refuge there. 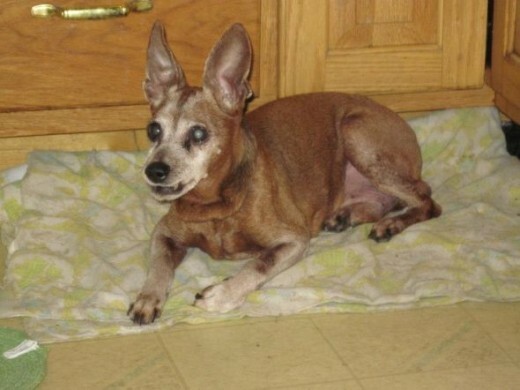 One day, the last week of February 2012, I read on Facebook about a blind senior chihuahua that had been thrown out of a car on Mellwood Avenue, a busy street in our city where a lot of traffic exits from I-64. This little dog was very fortunate to have been spotted by a volunteer with No Kill Louisville, an animal rescue group. No Kill was seeking a foster home for this dog and I wondered if my home might work for him. I had been thinking about getting a chihuahua for a few months anyway, and I thought my experience with blindness might be helpful with this little dog. I missed caring for a senior animal since the death of my elderly cat a few months before. I sent an email and asked if I might be considered to foster this little blind dog. I had an interview on the phone with the lady who was tasked with find a foster for him. There was an online application to fill out. I was approved and picked up the little brown dog that evening. The dog did not yet have a name, so my daughter and I got to name him. This sometimes happens, but often foster pets already have names. Not much was known about him. I was told he was a chihuahua, but eventually we decided he was a min pin instead. He looked like a min pin and definitely had a min pin personality! Volunteers canvased the neighborhood where Tito was found, but no one recognized him or knew anyone who had lost a small dog. Tito lived with us for 8 1/2 months and gave us a lot of challenges as well as a lot of love. In addition to being almost totally blind, he was hard of hearing and also had cognitive impairment due to old age. He had a terrible smell that bathing did not help. He was housebroken, but seemed to get confused at times over where he was supposed to go to the bathroom. He would stay awake all night and bark. In the yard he would bark at bushes. He would get himself trapped behind my patio swing and be unable to remember how to get out. His teeth were very bad and finally the vet had to pull all of them out. After this Tito smelled a lot better, but he could not pick up his foot out of his dish. He could not seem to figure out how to take a bite. So I hand fed him every meal the last six months of his life. Tito required a lot of intensive care, but I did not mind. He gave it all back in love and kisses. He was the most affectionate dog I had ever met, and he certainly melted my heart. He and my pug became very attached. We adopted a little kitten that summer, who immediately adopted Tito as his "mama" and they were inseparable. I was very concerned when one day in November, Tito began walking in circles. I thought he might have an inner ear infection, so my daughter and I took him to the vet for an antibiotic. Little did I expect the vet would recommend putting poor Tito to sleep. It turned out our little guy was having strokes in his inner ear and there was nothing the vet could do for him. He was suffering too much. So, we very sadly said goodbye to our dear little friend who had become such an important part of our family. I buried Tito in my backyard, and as I did I promised him that he would not be my last foster pet, but that caring for him would just be the beginning of my life helping many animals. So, my life as a pet foster parent began! I took a break from fostering animals after Tito died. Caring for him had been very time-consuming. I needed some time to take care of some health issues and a few things around the house. I was planning to take another foster dog in the summer of 2013, but fate had other plans. One evening, the night before Valentine's Day 2013, a friend of mine told me she wanted to rescue some cats from a shelter in Eastern Kentucky. These cats were on the list to be killed the next day (Valentine's Day) because their shelter was full. Woodstock Foundation was willing to pull them from the shelter. She asked if I would consider taking one of them. I agreed to take one, then asked her how many cats there were. She said there were six cats. I asked her how many foster homes she had found. She said one. Me. I was her only foster. So I said, "Okay, bring me two." Then I went back to look at the pictures on her Facebook wall of the cats. How could I pick only two and let the others perish? I worked out that I could put two in my downstairs bathroom and then I could put two in cages in the empty basement bedroom which was in the process of being redecorated. The room had no carpet and had not yet been repainted. I could keep a couple of cat cages in there for a week or two. As it turned out, I ended up with six cats, and a seventh went straight to the adoption center. At first I was afraid I had made a mistake, but very quickly I realized how wonderful it was to care for these cats. I found that knowing that we had saved the lives of these animals felt really great to me. It felt like one of the best things I had done in my life. All of the cats were wonderful and were going to make their new owners very happy. I was hooked on fostering! The photo to the right is the first photo I saw of one of the foster cats. She is also the first kitty I met when they arrived at my home a few nights later. She immediately reached her little paw out between the bars of her carrier to touch my hand and demanded I pay attention to her. I decided that night that I would adopt her, because I wanted a female kitten and thought she would have more difficulty being adopted due to being black. Black cats and dogs often wait longer to be adopted because of their color. I adopted her and named her Porta Valentini, but she was not the first kitty to move upstairs with me. As I cared for the cats, I fell in love with them all; but, I grew particularly attached to one of the boys, a grey and white kitten named Romeo. This loving male was very playful and friendly, but most of all he was super affectionate. His personality reminded me strongly of my old cat, Bubba, who had died about a year and a half before. I loved to see Romeo whenever I went downstairs to care for the cats. He was just an armful of joy and love. I began to feel jealous of whomever ended up adopting him. I started worrying about the day he would go to the adoption center, because I felt I would miss him a lot and it would remind me of losing Bubba. Then I started to think it would be like losing Bubba all over again. 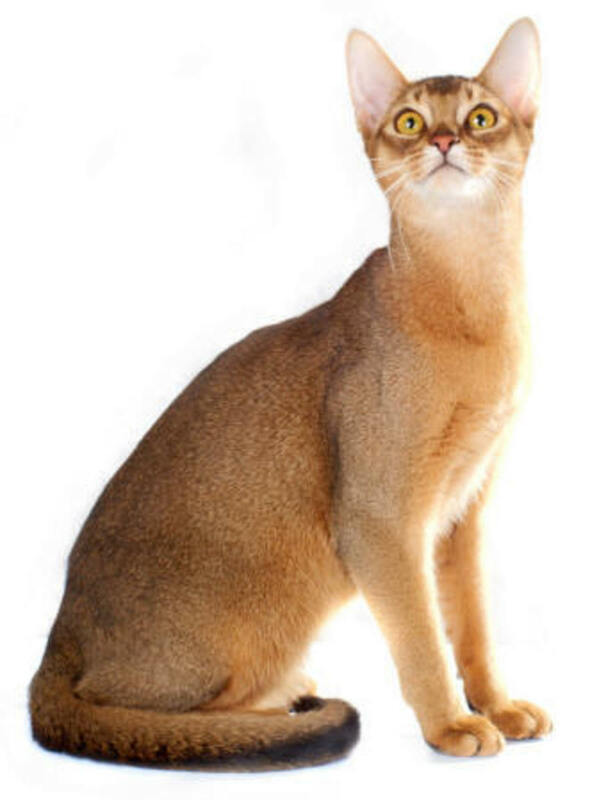 So, I talked myself into adopting one more cat if the rescue would let me. They said it was okay as long as I had him neutered first. We went to the vet the next day to have that done and Romeo moved upstairs with us. 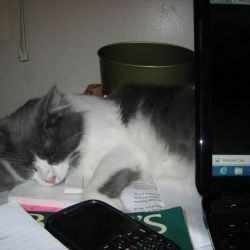 He is sleeping on my desk next to my laptop as I write this, and he is joy to have in the house. Because these cats were scheduled to die on February 14, and were literally saved at the last minute, we gave them all Valentine Names: Valentine, Hart, Romeo, Cupid,Lovebug and Porta Valentini. While the other cats in this cohort had all been strays, according to the shelter we rescued them from, these two kitties had been surrendered by their owner. They had both belonged to the same person, and for whatever reason, that person had decided not to keep them any longer. Rather than find someone else to adopt the cats, their owner had taken them to the shelter, with the understanding that they could be euthanized. Most cats who are taken to shelters in the United States are not adopted but are exterminated in the shelter. This is the pair of cats that I originally said I could care for in my bathroom until they were moved to the adoption center. We did not know what names the original owner called them. We named them Valentine and Hart. 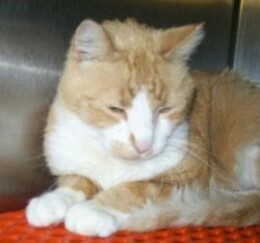 Hart was an adult male with a wonderful, laid back personality. Mostly he liked to just lie around. He ended up having to come out of the bathroom and into a cage, but he rarely complained about it. He was a very good natured guy and so easy to love! That's him in the photo at right. His sister was a beauty. She is the lovely kitty in the introduction photo at the top of this page. When I posted her picture on Facebook lots of people said they would love to have her, but no one ever stepped forward to adopt her. So disappointing, because this pair was easy to live with and would have made anyone a beautiful ready-made cat family. I had hoped someone I knew would adopt them, because then I could see them again, but that was not to be. Valentine and Hart went to the adoption center last week and are still waiting to be discovered by their fur-ever family. They have to be adopted together, so I anticipate it might take a while to find someone who wants them both. If they only knew how incredible these cats are! Update! Hart and Valentine were adopted together by a wonderful family! We named this quiet girl Cupid. She was very shy and would not let us near her the first week or so she was here. She remained very reserved and quiet. In time she came to trust me and she would always greet me by rubbing against my legs when I came to the cat room. I became very fond of her. Eventually all of the other cats were either gone to the adoption center or moved upstairs, and Cupid was in the cat room by herself. This was sad, so I just went ahead and brought her upstairs with everyone else until she was ready to go to the adoption center. I am not sure how long she will be here, but I am very happy to have her upstairs with us, and I don't really care if they never actually send for her! Shhh...I probably shouldn't say that, but I cannot help the way I feel about this sweet girl. Update! Cupid has been adopted! This Cat Came With a Little Something Extra! The cats came late at night and we had enough time just to get them all squared away in their safe places with food, water and litter trays. I did not get a good look at any of them until the next morning. When I looked the kitties over, I noticed one of them had a funny shape. Her middle seemed to bulge out like she had swallowed a little football. For the next two or three weeks I was trying to decide if she was pregnant. I thought she probably was, but various individuals kept trying to talk me out of thinking this. Finally I decided time would tell, and it did. 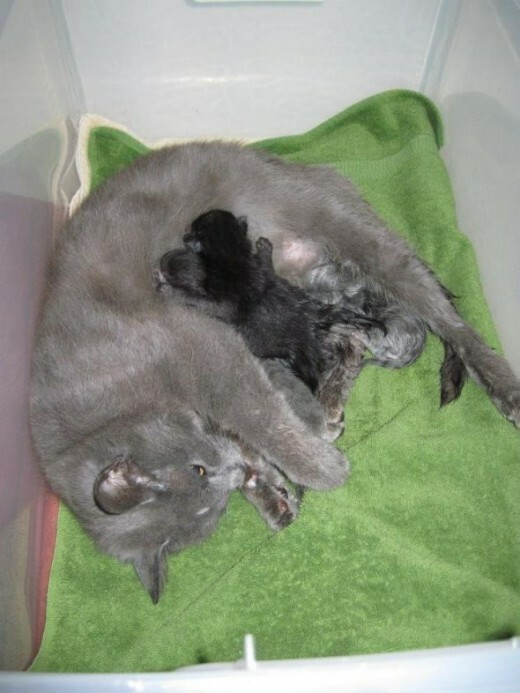 Two days ago I went downstairs and Lovebug had four tiny kittens! Surprise!!! Sadly, the smallest baby did not make it. As it turned out, for whatever reason, Lovebug has not produced enough milk to take care of her babies. 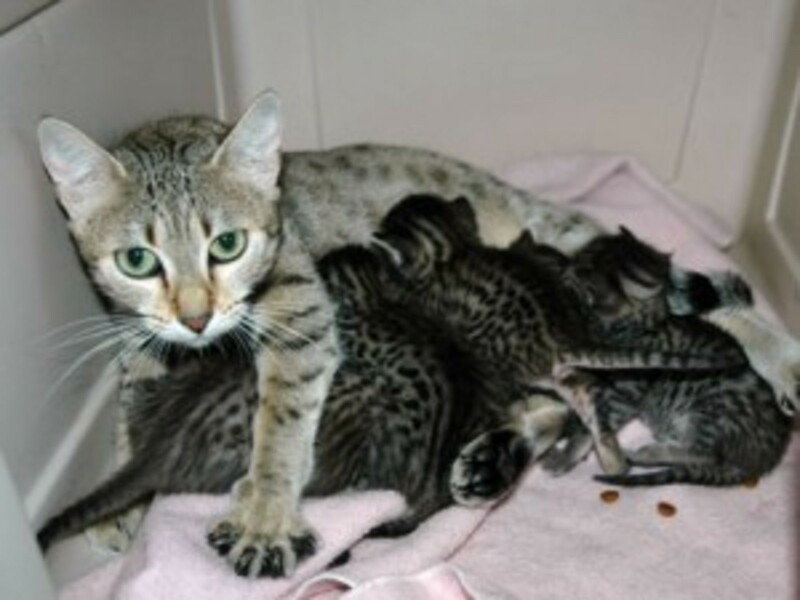 The mama and kittens were transferred to a medical foster who is able to provide around the clock care to the babies. I am very glad that specialized foster was available to do this, because it is a level of care I would not have been able to provide. Update! Lovebug is a wonderful mama and her babies are thriving! If you love animals, you should read this important book that describes the way the love of a pet can transform a life. Reviewers recommend you read this book with a tissue handy, because you will shed a few tears! Some words used to describe this book include inspiring, heartwarming, compelling and intelligent. The animals are presented with dignity. A Foster Dog is Saved from Death - Pets suffer when their humans become homeless. A couple of weeks ago I saw on Facebook that No Kill Louisville was looking for a temporary foster home for a senior dog whose owner was being evicted. This poor woman was unable to work due to disability, and with no income she could not pay her rent. Her attorney was trying to help her by finding someone to take care of her dog until she could get back on her feet. My heart went out to this poor woman who was sick through no fault of her own. I know what it is like to have your life devastated by a disabling illness. I also know things can get better, and I wanted this lady to be able to keep her dog. The relief in her voice was clear when I talked to her on the phone. They brought the dog to me immediately, and it has worked out well. He has been here almost two weeks now, and he is doing great! Whenever a new foster pet arrives, there is always a period of adjustment. The dog has to learn our routine and we have to learn his habits. A lot of it boils down to letting him know that I am his new pack leader and getting organized to make his care flow smoothly. This comes with a bit of trial and error. With this dog it took about a week for us to feel settled. Now that we have gotten used to each other, I am going to feel sad when he leaves to go back to his family. We are hopeful his family is going to be moving into their new home soon. I know they are going to be happy to have him back. It makes me feel great to have been able to give this incredible gift to this woman, a gift that could not have happened any other way except through pet foster care. I feel so happy to be able to do this for another person! Update! 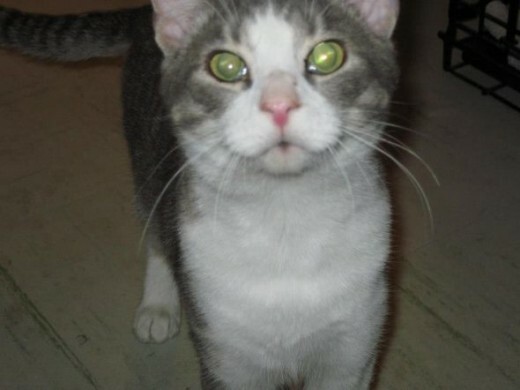 March 31, 2013 - Bam Bam has been here a month and his owners cannot find affordable housing that will take pets. They haven't given up and are still trying to find a place to live. 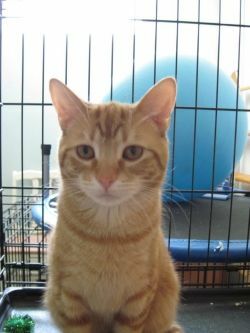 On March 13, when our cat room had been empty for a few days, I saw a notice that the same shelter had eight more cats who were scheduled to be euthanized the next day. After consulting with my colleagues, we decided to pull them. Melissa made the arrangements and picked them up two days later. The picture to the right is the first one I saw of this cohort. It was this photo that caught my attention and moved me to action to rescue these cats. We named this senior kitty Patrick. He is around 12 years old, according to the veterinarian. He has some dental issues and clouding of the cornea. 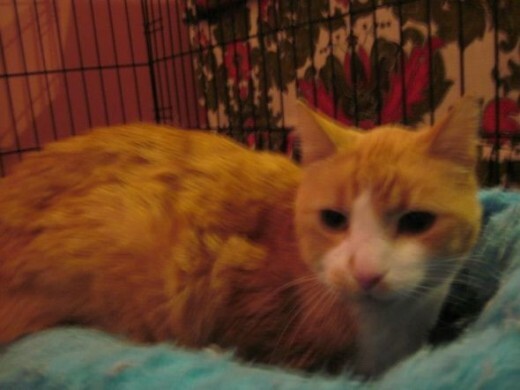 Unfortunately, Patrick has some health problems and does not feel well. We noticed as soon as he arrived that he drinks a lot of water and urinates heavily. We are worried he might have diabetes or kidney disease. He has been to the vet now and we are awaiting test results. We hope he has a correctable problem. Woodstock Foundation is collecting donations to help pay for his veterinary care. If you would like to donate to Pat's vet bill, you can use paypal to make a tax deductible donation to Woodstockanimalfoundation@yahoo.com. You may designate your donation to Patrick if you desire. Update! March 31, 2013 - Patrick was diagnosed this week with hyperthyroidism. He will have to take a pill twice a day for the rest of his life, but he can be healthy! Yay! We have moved his cage upstairs for the time being to make it easier for me to administer his medicine. He loves to be cuddled and buries his head in the crook of my arm. He just wants to get out of his cage and be someone's little love. Update! April 20, 2013 - Patrick took a turn for the worst a week ago and started vomiting. Then he lost his appetite and stopped eating. He was vomiting bile and any water he drank. He went to the vet and was diagnosed with gall stones. He continued vomiting even on the anti-nausea medicine, and Woodstock made the decision to move him to a medical foster home. I miss him, but am very relieved that he is able to be in a quieter environment with someone more experienced with these issues than I am. Another photo of our senior foster kitty, Patrick. We named this striking calico, Chatty Cat, because she loves to talk! 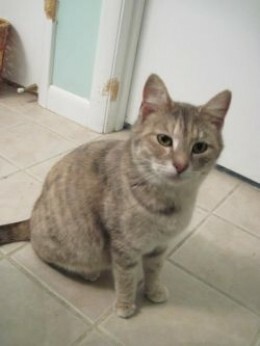 She is a very vocal kitty, and also very friendly and affectionate. She would love to be taken home and be somebody's little girl friend! We do not know her exact age, but she is an adult. She has a playful and outgoing personality. She would love to have someone to play with full time. Update! March 31, 2013 - Another kitty with a secret. Chatty is pregnant! We expect her babies to be born in mid-April. Update! April 20, 2013 - Chatty went to the vet for a prenatal visit. She said her kitten will be due around the end of April. We have not named this gray boy cat yet. Isn't he handsome? I just love this cat! This fellow is friendly, but does not much like being in a cage in a room full of other cats. I think he would blossom in a home where he could be the only cat. 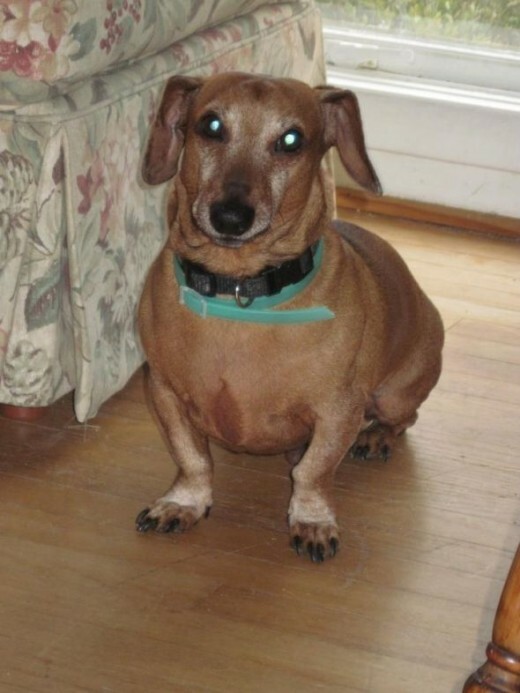 He would love to spend his days napping in the sun, and his evenings watching tv or reading by the fire with his human. He is a big, cuddly cat and a joy to have around. Update! April 1, 2013 - This kitty's name is Isaac! 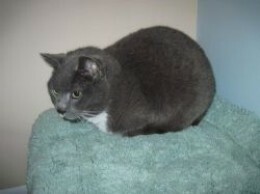 Little Gray and White Male Cat - First to Go to the Adoption Center! Meet Jaspurr! It was hard for me to take his picture, because he is a very active and playful little guy. We think Jaspurr is about 8 months old. 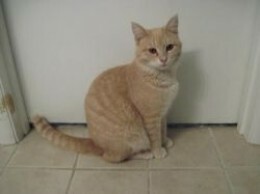 He loves to play and is very friendly and affectionate. Jaspurr went to the adoption center today. I expect someone will take him home very soon. He is extremely lovable and charismatic. I don't think he will have to wait long for his fur-ever family to find him! Update! 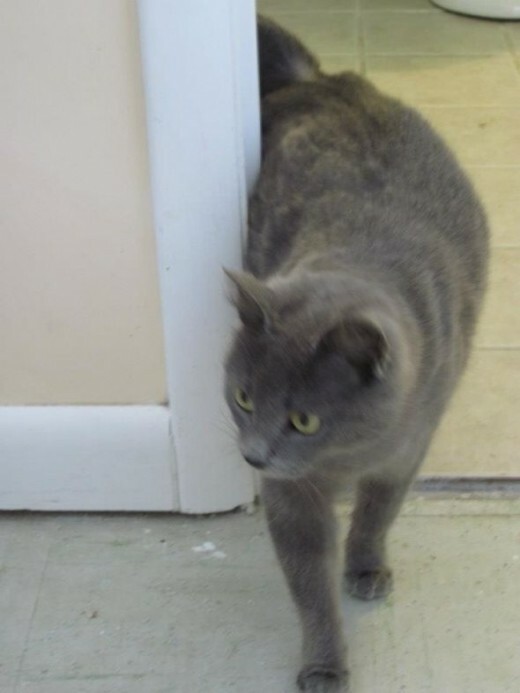 March 31, 2013 - Jaspurr has been adopted! Yay! She may be here a while! This is Sassafras! She's a woman who knows what she wants, and mostly what she wants is to be left alone until she wants your attention. She does not want to be told what to do, and she does not want attention when she wants to be left alone. If Sassy wants to be out of her cage and you try to put her back in, she will fight for her freedom. I have the scratches to prove it! Unfortunately, she has to be in a cage, because she is not nice to the other kitties in the cat room. 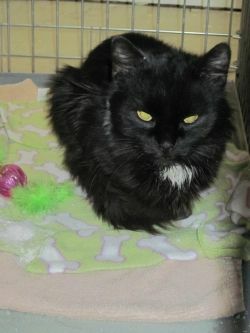 We think Sassy may be here a while until she can sweeten up a bit, unless we can find an adopter who enjoys a challenge. Teagan is a sweet little gray and white girl, about six months old. She is not a shy cat, but she is also not overbearing. I would say she is just right: friendly, but not pushy! Teagan will be going to the adoption center this week and I bet she finds her fur-ever family lickety-splt! Update! 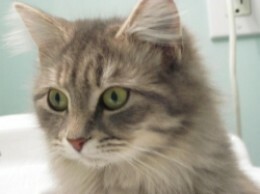 April 2, 2013 - Sweet little Teagan has gone to the adoption center. I am going to miss her. She is so cute and friendly! I gave her some good cuddles this afternoon to say goodbye and wish her well. I know someone is going to fall in love with her soon and she will be going home to a new family very soon! This is the hard part of fostering, but it is only by letting these animals go to another permanent home that we are able to save more cats. 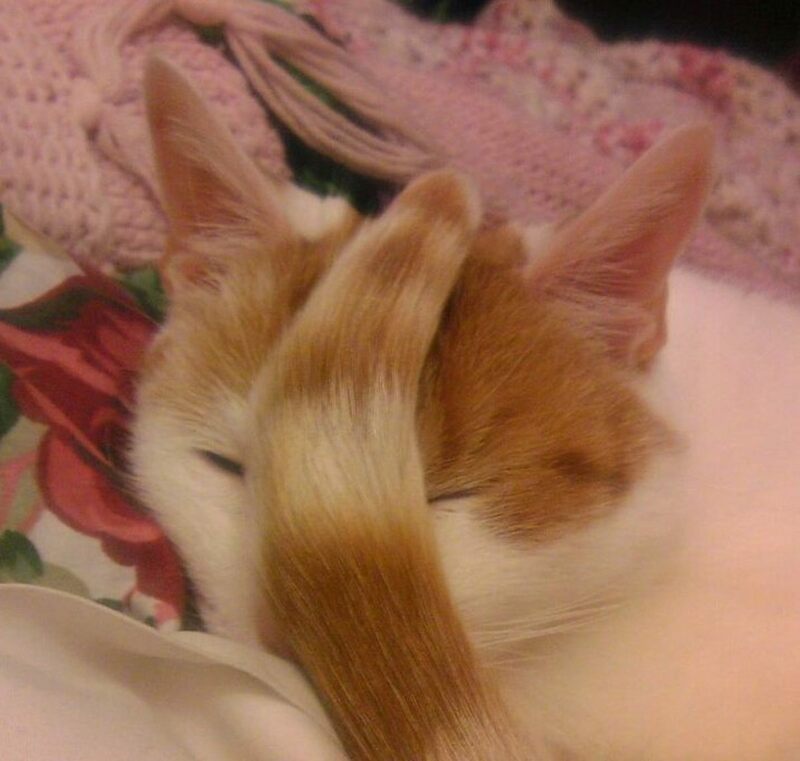 Another Cat with a Secret! Esme was the shyest kitty to ever grace our cat room. For weeks she hid herself whenever a human came in to feed or clean. She always found the most private of spots and rarely showed herself. We were not even sure if she was eating or not at first. Then she became more confident and started sticking around to say hi and get petted when I would come down to feed. At one time I felt like she might be pregnant, but then decided my mind was playing tricks on me. I forgot about it, deciding if she were that Chatty would be delivering first anyway, and by then Esme's situation would be more clear. 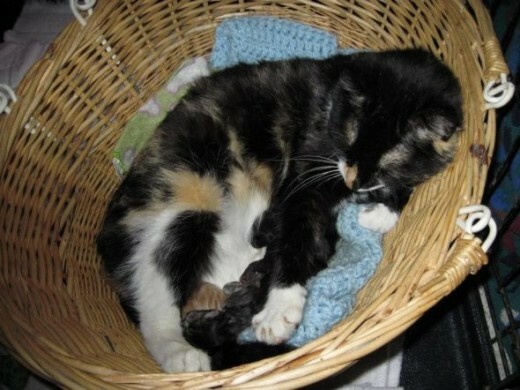 On Monday, April 15 Melissa went down to clean and discovered that Esme had four kittens with her. She put them all in a cage, because that was all we had to provide Esme's new family with some privacy. Here is a photo of the new mama and her babies! I'll post more about the cats in this cohort in the coming days! 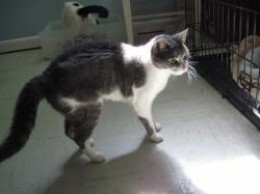 Melissa called me on March 19 to ask me if we could take a pregnant cat from the same shelter. She was on the kill list for the next day. The shelter had called her and asked her if we could take this mama cat. How could I say no? So, on Friday Melissa and Leslie picked up this pregnant kitty and now she is in my downstairs bathroom awaiting the birth of her kittens. We don't know how far along she is in her pregnancy, but I expect her to have her babies sometime in the next week or two. Update! 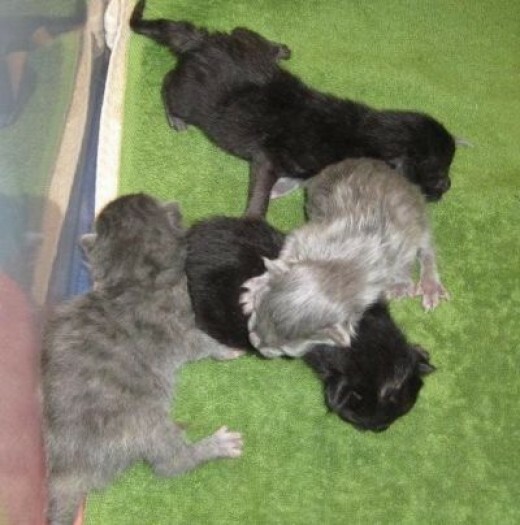 April 4, 2013 - Mama Cat had her babies! I went downstairs to check on her and she had just given birth to her second kitten. I ran upstairs to grab my phone and by the time I got back downstairs she was delivering the third. More than an hour passed before the fourth baby was born. By that time Leslie had arrived at my house and got to witness the birth. I think she got a good video. I'll try to get a copy to post here if I can. Meanwhile, check out the pics of Mama with her babies! If you love to read about foster animals, here are some additional suggestions! Read about the cats of Kittyville, the neighborhood of kitties at the largest no kill animal sanctuary in the US. The true story of a woman who rescued a disabled dog only to discover that the dog was rescuing her. After Foster adopted a shelter dog, he began noticing stray dogs everywhere he went. Some of these moved in with him. This is the story of how these rescued dogs got him through some very challenging times including 9/11, a heart attack and Hurricane Katrina. Read the stories of 70 dogs who were abandoned, neglected or abused by their humans, but were later rescued, some at the very last minute before they were scheduled to be killed. Some of them went on to lead amazing lives of heroism and fame. Philip was disabled as the result of an accident and about to give up on life. After adopting a shelter dog at the suggestion of a friend, Philip found love and hope. He also realized his new friend had a special ability to find and bring home abandoned and injured cats. Philip and his dog now care for more than 60 outdoor cats, an effort that has given Philip a new reason for living. Mama Cat nursing her newborn kittens, only a few hours old. Do you have experience fostering pets? I am currently fostering one or more pets. I have fostered animals in the past. I have been thinking about fostering a pet. I have never really considered fostering pets until now. I think I might like it. I don't think fostering pets is for me, but I like helping animals in other ways. I will leave the care of animals to others who like that kind of thing. Loc arrived at my shelter house on March 30. A family had found her as a stray kitten, but decided not to keep her because they already had too many animals. They were prepared to take her to the kill shelter in our city, but the wife of the family decided to contact rescues to see if she could be adopted instead. Loc is somewhat unusual in that she is a female orange cat. She seems like a sweet girl, but she is scared in our shelter and doesn't understand why she is here. I hope she will be adopted soon. Update! April 2, 2013 - It's a boy! Lok has male parts! 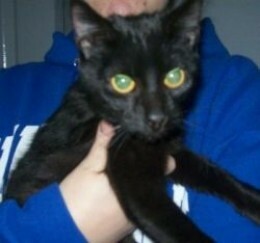 Lok will be going to the adoption center this afternoon. He wins the prize for the kitty staying the shortest time in our shelter! Update! April 2, 2013 7pm - Loc has gone to the adoption center. He was only here three days, and up until this afternoon we thought he was a she, because the previous owner told us this. None of us thought to check and make sure. Lesson learned! This is Sinatra! 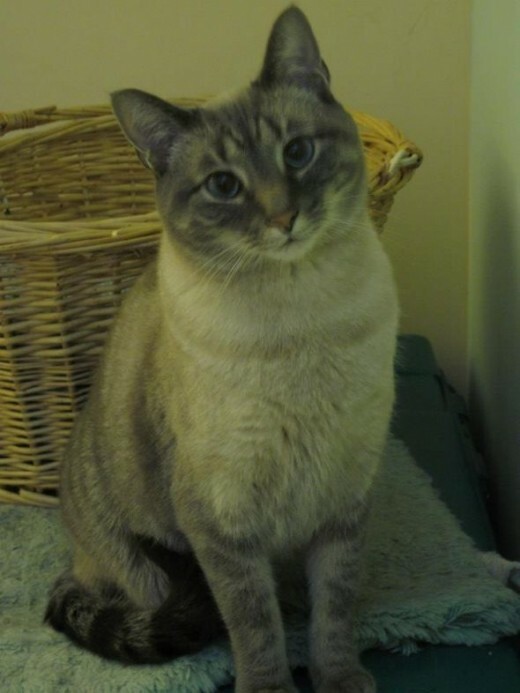 He is a beautiful Siamese mix who arrived on April 5. 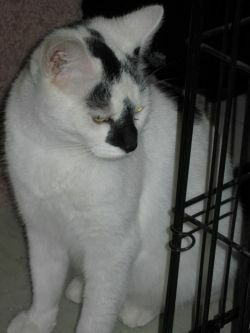 He is leaving for the adoption center today, April 13. He is very friendly, and as you can see, he is quite lovely! A week later we received Newman, another Siamese mix from a shelter in a different part of the state. It seems to be the season for Siamese mixes! Both of these boys have gorgeous blue eyes. Update! April 20, 2013 - Both of these handsome boys went to the adoption center this week. 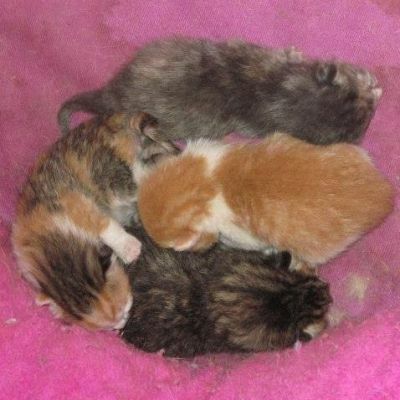 Includes Lovebug's four kittens, Mama Cat's four kittens and Esme's four kittens. Excludes one litter yet to be born. Woodstock Foundation is currently helping so many foster animals at this time that finances are strained. We welcome any assistance someone might like to share to help these animals. We are unable to pull additional animals for rescue until some of the organization's vet bills are paid down. This means that animals will die in the shelters due to lack of foster homes. The rescue in my basement is run entirely by volunteers: Melissa, Leslie and me. We provide safe shelter, food and water, parasite treatment for all animals, and veterinary care for any that are sick. 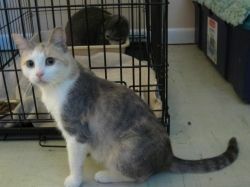 As space becomes available we move any cats who are ready to the adoption center to find permanent homes. We go through several bags of litter per week, lots of food and wash one load of linens per day for the cats. High quality cat and/or kitten food. Non-toxic cleaner, wipes, paper towels and hand sanitizer. Old towels, rugs, baby blankets or other bedding. 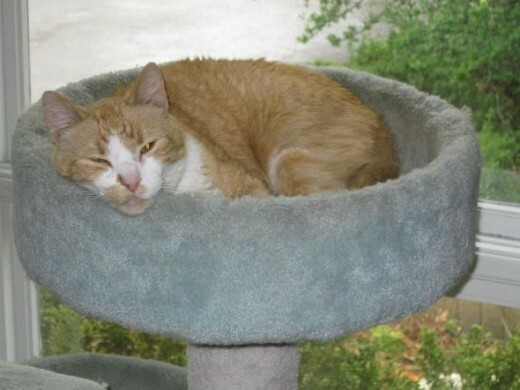 Patrick enjoying a cat tree donated by my friend, Maryellen! Please share your experience with foster pets! Have you fostered animals? Would you like to? 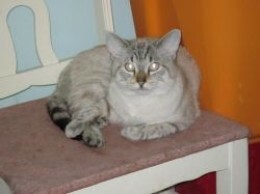 @Virginia Allain: I've rescued a couple of strays over the years but usually was given a kitten by a friend. I've never bought a cat as there are always plenty needing homes. Those kitties and dogs have no idea how lucky they are to get saved by you. Best of luck to all of them finding nice homes in the future.